"Super Kanji Search -IVS Enhanced Version-" is an enhanced version of the character input tool "Super Kanji Search". "Super Kanji Search -IVS Enhanced Version-" supports Unicode IVS(Ideographic Variation Sequence) and the function of pasting searched variant characters to other apps. 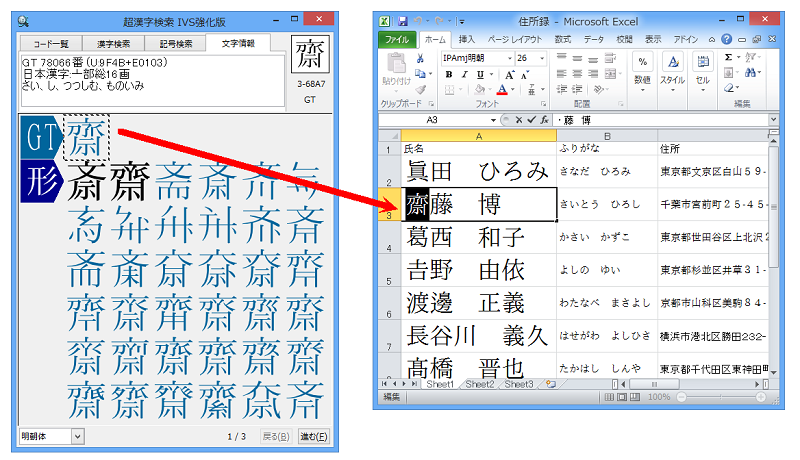 If you have PC with "IPAmj Mincho Font", you can paste more than 50000 searched kanji and variant characters(*8) to Windows apps including Notepad, Word, Excel as a character. Thanks to "Super Kanji Search -IVS Enhanced Version-" and "IPAmj Mincho Font", you can efficiently search and input variant characters. Additionally, you don't have to make and manage external characters for handling variant characters for names. As a result, you can cut the cost of external characters. This product is mainly designed for corporate customers including local governments, public offices, governmental agencies and private companies which handle a lot of variant characters for names. According to your demand, we can also provide the solutions for variant characters, external characters and multi-kanji. For example, we can provide the customized "Super Kanji Search" which supports both your existing external characters and "IPAmj Mincho Font" or the converter which can convert your existing data by external characters into the highly-compatible data by Unicode IVS. Press Release: "Super Kanji Search -IVS Enhanced Version-"
Who Need "Super Kanji Search -IVS Enhanced Version-" ? Those who want to use more kanji characters and correct character shapes on PC. Those who want to make / manage lists including variant characters and kanji for names. Those who are using the Unicode IVS/IVD based font like "IPAmj Mincho Font". Those who are making ebooks with multi-kanji contents. 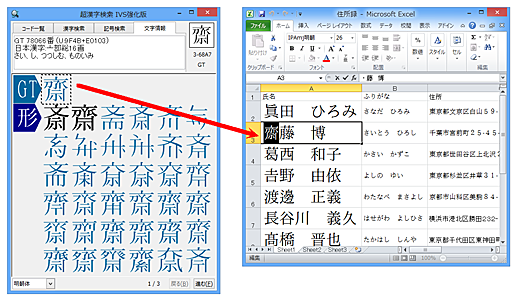 Features of "Super Kanji Search -IVS Enhanced Version-"
You can paste the searched multi-kanji and variant characters by Super Kanji Search as the character to documents of Windows apps(*1) including Notepad, Word and Excel. This software supports more than 50,000 kanji characters. We will increase the total number of kanji characters by the future maintenance of dataware. 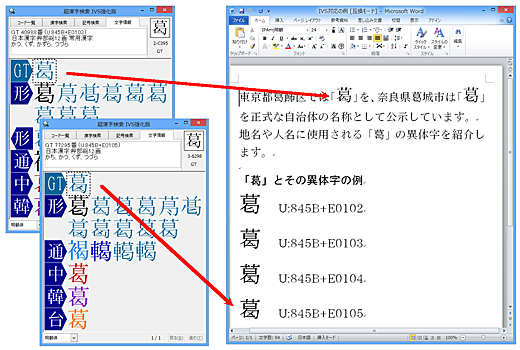 Multi-kanji and variant characters pasted in Windows documents are coded by the functions of Unicode IVS/IVD. These characters can be used mutually with no character corruption if the environment is changed, because they are not external characters. It is hoped that this software will improve the circulation and compatibility of the data including multi-kanji and variant characters. This software supports "IPAmj Mincho Font". This software runs on the environment with this font. We can customize your system if you want to use the other Unicode IVS/IVD based font. In addition to kanji's reading and strokes, you can use parts of kanji, variant characters and their combination as the search keys. You can search kanji characters by intuitively simple search keys. The simple way of searching characters in this software has adopted the character search functions of the existing "Super Kanji Search" and "Super Kanji" series sold for over 10 years. PMC receives many compliments on this way of searching kanji characters. We can develop and provide the customized version. For example, we can provide the tool for the input of multi-kanji and variant characters according to your character environment, by adding your external characters as the targeted information for searching. (*1)The apps have to be supporting Unicode IVS/IVD and run on Windows 7, Windows 8, Windows 8.1 or Windows 10. 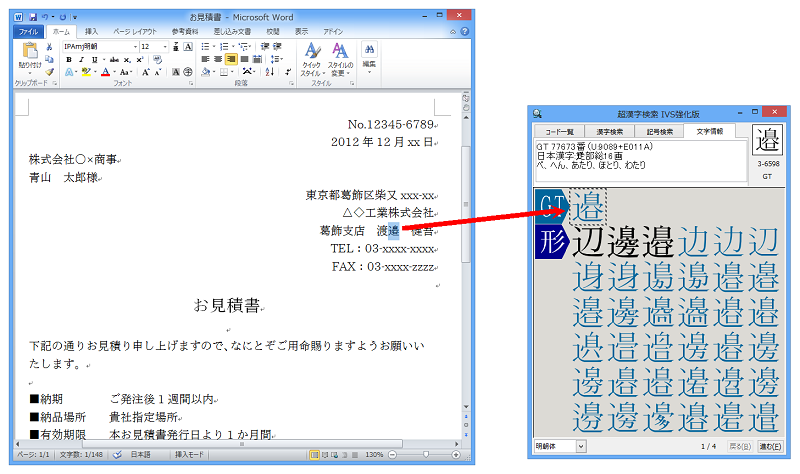 If you are the user of Windows 7, Microsoft Office 2007 or Office 2010, you can use Unicode IVS/IVD functions by downloading and installing the additional program for supporting IVS "Unicode IVS Add-in for Microsoft Office" (IVS Add-in Download http://ivsaddin.codeplex.com/). According to the customers' demand, we can provide various customized versions of Super Kanji Search. Kanji characters in Unicode IVS/IVD can be highlighted for easy finding of the desired character. By adding your external characters as the targeted information for searching, your existing characters can correspond to Unicode IVS/IVD. We can provide the customized version which supports Unicode IVS/IVD except Hanyo-Denshi Collection (e.g. Adobe-Japan1-6). 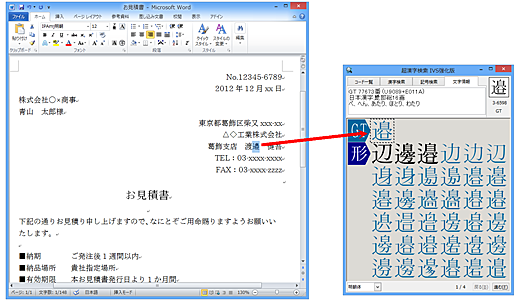 A Variant Character is Pasted to a Word document. A Variant Character is Pasted to a Excel sheet. Character Information and Character Code about a Variant Character in a Word document is Displayed.